WASHINGTON (CNS) -- As chapels go, the simple structure on property owned by the Adorers of the Blood of Christ congregation in Columbia, Pennsylvania, is not much. It's more of an arbor, really: four posts and several cross boards built near a cornfield on farmland the sisters lease. Several pewlike benches are arranged around it. Still, said the sisters, it stands as a symbol of resistance by people of faith to a planned natural gas pipeline called Atlantic Sunrise that developers want to build through miles of farmland and small towns of picturesque Lancaster County. 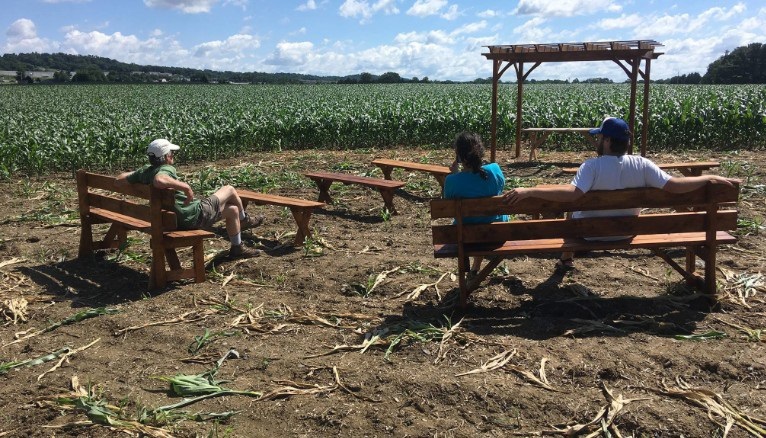 The pipeline's path takes it through a strip of land the congregation owns in the Harrisburg Diocese that includes farmland and the sisters contend that construction poses a danger to God's creation. They have declined repeated offers of compensation from Transco, the project's developer, to allow an easement for it to be built. "This is something that we felt as a matter of conscience," said Sister Sara Dwyer, coordinator of the congregation's justice, peace and integrity of creation ministry. "We had to look at it more deeply and take a stronger stand." Allowing the pipeline through the property would run contrary to the congregation's Land Ethic, she explained. Adopted in 2005, the document upholds the sacredness of creation, reverences the earth as a "sanctuary where all life is protected" and treasures the earth's beauty and sustenance that must be protected for future generations. Further backing its claim, the congregation filed a civil rights lawsuit July 14 in U.S. District Court for the Eastern District of Pennsylvania challenging the pipeline. The complaint argues that the Federal Energy Regulatory Commission's Feb. 3 order authorizing construction and operation of the pipeline violates the sisters' right to practice their faith under the Religious Freedom Restoration Act. "FERC's decision to force the Adorers to use land they own to accommodate a fossil fuel pipeline is antithetical to the deeply help religious beliefs and convictions of the Adorers. It places a substantial burden on the Adorers' exercise of religion by taking land owned by the Adorers that they seek to protect and preserve as part of their faith and, instead, using it in a manner and for a purpose that actually places the earth at serious risk," the complaint reads in part. Attorneys for the sisters argue in the filing that allowing the pipeline through the property "would harm God's creation, violate the sacred nature of their property and interfere with their right to freely exercise and practice their religious beliefs in the use of their own land." The lawsuit asks the court to overturn the Federal Energy Regulatory Commission's action and have the pipeline rerouted from the Adorers' 24-acre plot eyed by Transco. The Adorers' stance has inspired others who have opposed the entire 183-mile pipeline since it was proposed three years ago by Transco, which is owned by Tulsa, Oklahoma-based pipeline company Williams. The pipeline will carry natural gas from hydraulic fracturing wells in northeastern Pennsylvania to existing pipelines that run 10,200 miles from New York to Texas. The chapel was dedicated July 9 with about 300 people attending. People prayed for guidance in their effort to oppose the project, listened to the Land Ethic being read, and heard from a group of Sisters of Loretto from Kentucky, who joined religious and community groups in a 2013 campaign to oppose another pipeline project by Williams in the state. Williams pulled out of the venture in 2014 citing market forces. Mark Clatterbuck, Lancaster Against Pipelines co-founder, said the Adorers have inspired the effort to stop the pipeline. "Having the sisters publicly involved reinforced the moral and religious anchor that has guided this movement," he told CNS. "Lancaster Against Pipelines has never been a religious organization," Clatterbuck added, "but for a lot of the leadership and core folks doing the work, it's always been a spiritual and religious battle for us. This is care of creation, stewardship of the earth." News of the chapel caught the company's attention, said Chris Stockton, a Williams spokesman. Company lawyers filed an emergency motion in U.S. District Court for the Eastern District of Pennsylvania to take immediate control of the land through eminent domain, which allows the government to appropriate land for the public good. A federal judge, however, denied the emergency request July 7. The judge said that although the project had been approved by the Federal Energy Regulatory Commission, an already-scheduled court hearing set for July 17 in cases filed against all landowners who have turned down Transco's monetary offers for easements would be the appropriate venue to hear arguments. Stockton told CNS said company was concerned that the chapel was going to be a more involved "permanent structure" and it responded to head off any effort that would delay pipeline construction, which is set to begin this fall. He said the easement being sought from the Adorers involves about an acre. "The reality also is (the property) is a cornfield and farmed by a tenant farmer. Once (the pipeline is) constructed, it can still be farmed and still be utilized for the same purpose if they want to put the arbor up again. Or they can put it up in any other location," Stockton said. Taking such a public stance is new to the Adorers, said Sister Janet McCann, a member of the congregation's leadership team in St. Louis. She offered a reflection at the chapel dedication. She said if energy companies wanted to invest in sustainable or renewable energy projects on their property, the order would listen. "We want the energy companies to invest all this time and money and resources into finding sustainable energy sources," she said. "That's how this is going to happen. The system has got to change. That's why we're standing up to this. "And we are extremely encouraged by the amount of support we're getting from all sorts of people, from all sorts of faith tradition and people from no faith tradition who have a love for the earth." Lancaster Against Pipelines planned a picnic and prayer service at the chapel July 14 in advance of the court hearing. Some of the Adorers planned to be there. The sisters realize the courts could clear the way for construction, which would force the chapel to be removed. "From a congregational point of view," Sister Sara said, "we're just taking it one step at a time and seeing what happens next." Editor's Note: The Adorers of the Blood of Christ's Land Ethic can be read in full at http://adorers.org/asc-land-ethic. Isn't it lamentable that the none of the sisters can stand at the altar and celebrate the Eucharist? I admire your tenacity and perseverance but how do you know God wants women to be priests ? The congregation's Land Ethic "upholds the sacredness of creation, reverences the earth as a 'sanctuary where all life is protected' and treasures the earth's beauty and sustenance that must be protected for future generations." Such a statement as the congregation's seems pagan to this orthodox Christian, who believes he is living after the Fall on the earth under God's curse. I take that back. I doubt any pagan with common sense would say that the earth is a "sanctuary where all life is protected". This is as close to paganistic idolatry as ever anything I have seen, worship of an "earth-mother goddess". Refusal to utilize the gifts given to us by the Almighty -- is rejection of the Majesty. Would suggest that the good sisters re-read Genesis 1. Appears to be blasphemous, really, using Christ for personal political views. Perhaps they pray for meat eaters or those who drive gasoline powered vehicles. Forgive my sarcasm, but the self serving and arrogant indulgence of these individuals who are now in the glorious limelight betrays any religious conviction if only because it appears to be based on a type of pseudo moral superiority, just like ANY pagan priestess of old. Lord help us. I am so bored with radical SJW nuns. More spirituality, less politics. I believe this is more about their egos. Bravo to the nuns! Once again, these women are leading the way, showing the rest of us what it means to live our faith. The last line of this article - "we're just taking it one step at a time and seeing what happens next." - echoes that of Francis a few days ago: that we are not shown the way through the darkness, we are guided. I'm an old guy and I'm with Beth and not with the critical guys on this. You go sisters! I'm sure that Jesus and the apostles heard similar complaints and criticism. It's not about faith, really, it IS about politics. Jesus and the Apostles were addresssing basic human failings and not individual policy. And as for those who are more interested in the sexual nature of the protestants, if they were men I would have the same dismissive attitude. Interesting attitues in that we've had manipulative and self serving men in positions of power for so long that, now, to make amends, we need woman to do such. Balderdash.